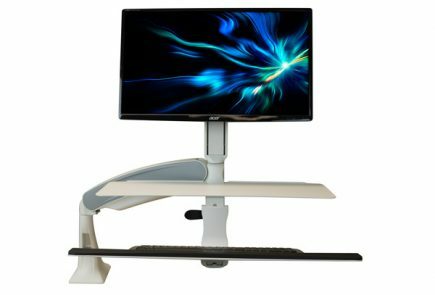 The FlexiSpot enters the standing desk converter fray competitively priced and poised to help disrupt the Varidesk’s lengthy reign. Loctek sells monitor arms that can be used with the Flexispot. Not the most ergonomically sound given the lack of adjustability on the keyboard tray. 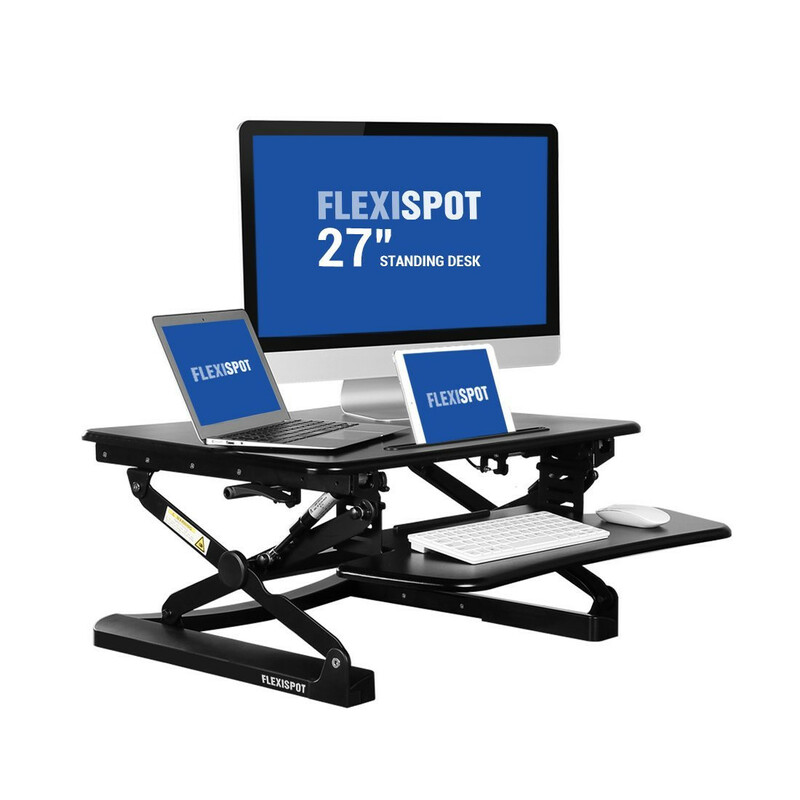 But if you’re looking for “second-to-none” stability and spacious work surfaces, the FlexiSpots are some of the best standing desk converters on the market. 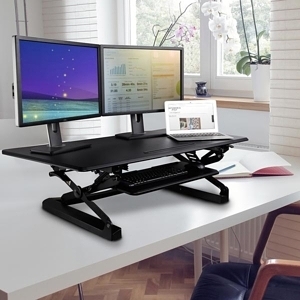 The Flexispot Desktop Workstation is actually a series of four standing desk converters made by Chinese office fitness manufacturer Loctek—the M1 (27"), M2 (35"), M3 (47") and M4 (41"Corner Cut). All the Loctek products—including their monitor arms, standing desks and desk bikes—are now available under this new Flexispot brand, which appears to be designed to better target the American audience. We had the opportunity to spend a little time with these new units at the ErgoExpo trade show, and came away impressed with their price point and stability. 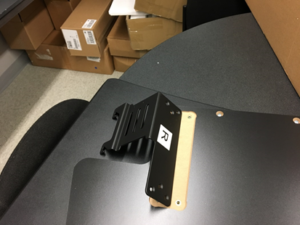 These desktop risers are squarely in the Z-lift category (one of five categories of lift mechanisms we explore in our round-up review of the best standing desk converters). Within the Z-lift category these Flexispot units are marketed first and foremost as Varidesk alternatives, but their closest comparable is actually the Ergotron Workfit-T given that its key differentiating feature is a straight up-and-down lift mechanism versus the forward arcing mechanism of the Varidesks. What’s the benefit of FlexiSpot’s straight up-and-down lift mechanism? Chiefly, it’s a space-saver. Forward-lifting models require you to step back from your desk while you lift them, occupying more of your office space than you would otherwise. This isn’t intrinsically a problem—that is, unless your cubicle reminds you of the size of an airport sleeping pod, the sad reality for many of us office workers. In that case, you’ll fight for every square inch, and a straight-up-and-down lift mechanism like the FlexiSpot’s is a major bonus—a tool to keep claustrophobia at bay. But space-saving isn’t the only benefit of a vertical lift. It enhances stability compared to the forward-arcing models. Forward-arcing lifts create what mechanical engineers call a moment lever—a teeter totter effect, where pressing down on one end of the device, say the keyboard, causes the other end to lift up off the desk. We observed this effect on the Varidesks, and it was the key reason for their instability in the upper height regions (albeit reduced once monitor weight was added). Fortunate for the FlexiSpot, its vertical lift design sidesteps the teeter totter issue altogether. With its pneumatic assist, it’s a breeze to lift, and requires no hunching over like some of the forward-arcing models do. The end result is a lifting motion that will save your back from strain compared to the Varidesks. The FlexiSpot models boast 12 height presets, which “one-ups” the Varidesk’s 11 but is still less than the Ergotron WorkFit-T’s 20. In the past, we’ve observed most units with a fixed number of heights like the Flexispot’s tend to make ‘clicking’ noises while they notch into place. Sometimes this effect is more noticeable than others—it was significant enough to annoy coworkers in the Varidesks but subtle enough to be ignored in the WorkFit-T. The Flexispot we have to place in the same category as the WorkFit-T in this regard. It makes little to no noise while notching into place. Do make sure the handles are fully engaged while lifting of course. 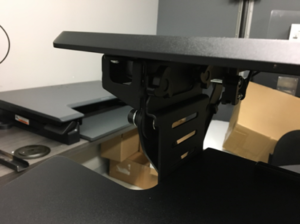 No standing desk converter can compete with a full-blown stand up desk when it comes to plentiful desktop space or stability, and the FlexiSpot is no exception. These are probably the two top reasons to choose a stand up desk over a standing desk converter. But some converters still offer sufficient work surface space and stability for casual standing, and the differentiating factor is in the design. The best-selling 35”-width model has a work surface depth stretching to 35.1” (including the keyboard tray), considerably larger than comparable Varidesk models and even the WorkFit-TL. For mechanical engineers, the challenge means balancing at least three variables: 1) making the base small enough to fit on an existing desk, 2) maximizing the size of work surface space, and 3) ensuring the unit has rock solid stability even at the upper height levels—all at the same time! FlexiSpot has managed to balance these three criteria as well as any device we’ve tested. Its base is small enough to fit even on narrow 24” desks, its work surfaces offer unprecedented depth (helpful in creating the proper viewing distance between you and your monitors), and the unit is rock-solid even at its upper height settings. One important thing to note though is that these models require some assembly. 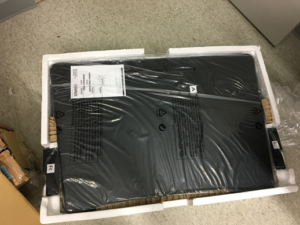 Unlike the ZipLift, the WorkFit-T, or even the VariDesk, which come pre-assembled and can be set up right out of the box, the FlexiSpots will take about 25 minutes or so to assemble (really a small price to pay for converters of this quality). 2. There are 6 packaged kits (labeled by letters) to use during the assembly process. 3. User must attach mounting brackets to the keyboard tray using two screws provided (you’ll have to locate your own screwdriver). 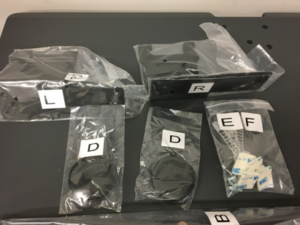 Update: The 35″ models and the Black 47″ model no longer require screws for installation. 4. The user must hang the keyboard tray from four bolts under the primary work surface. May take some time to hook the brackets on the bolts to secure. 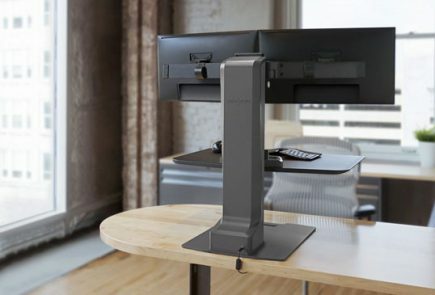 Z-Lift standing desk converters are some of the most sturdy converters around, but even within this category some perform better than others. We already mentioned the pitfalls of the ‘teeter totter’ effect on the Varidesks and how the FlexiSpot avoids this problem by lifting straight up-and-down. According to our tests, the FlexiSpot has lateral stability that matches the ZipLift and the WorkFit-T’s—even in the top height settings, and forwards-backwards stability that equals these two competitors as well. A cursory glance at Amazon reviews confirms customers make a similar judgment. Featuring a "Dropped Keyboard Tray"
A dropped keyboard tray is a keyboard tray that rests lower than the work surface on which the monitors reside. The design has been around for years, and you’ll see it on most Z-Lift and Hover-Style standing desk converters. Its key benefit is creating sufficient vertical distance between your keyboard and monitors so you can stand and work without craning your neck down to see your screen. Nowadays, we expect to see a dropped keyboard tray on all Z-Lift converters—otherwise, we're dealing with an outdated design. The FlexiSpot checks a necessary box, and it does so while providing its signature spaciousness as well as the ability to detach the keyboard tray for when you want to write easily on the work surface itself. The FlexiSpot's keyboard tray rests lower than the main work surface, retracts in, and can be removed, but it does not tilt down like some other models. But while the FlexiSpot ‘checks the box’, it is important to note that its keyboard tray is probably the weakest link in an otherwise stellar, top notch product. The most ergonomically-advanced keyboard trays for standing desks tilt downwards to allow typing in a more neutral, non-straining position. Ideally, the angle would reach up to about -30-degrees, but any decline is better than none. Since the tendency at a standing desk is to press your palms against the desk while you type, this stress on your wrists can potentially lead to health complications down the road like carpal tunnel. We’d really like to see all standing desks come equipped with keyboard trays that tilt to address this ergonomic dilemma—they're especially useful for writers, lawyers, and others who spend hours a day typing. The most state-of-the-art designs do now include some kind of tilting feature, but the FlexiSpots’ fixed horizontal angle for the keyboard tray is not unusual for standing desk converters. 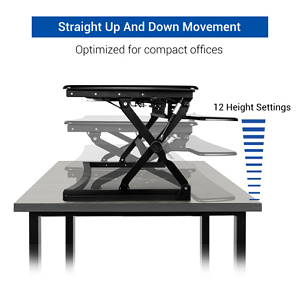 All said and done, the FlexiSpots add new flavor to the Z-Lift standing desk converter competition with extraordinary spacious work surfaces, a simple, easy-to-use lift mechanism, and excellent stability at all heights. They may not be the ergonomic virtuosos of the bunch (no tilting keyboard tray), but to make matters even more competitive, the best-selling 35” model starts at a mere $299. 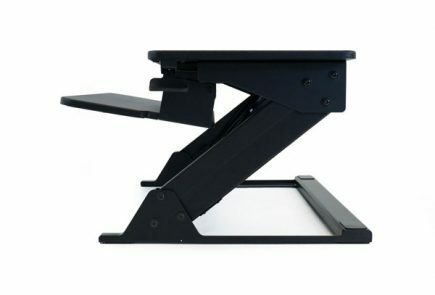 If you're looking for a well-priced standing desk converter that competes on most specs with the best of them, the FlexiSpots are worth a second glance. 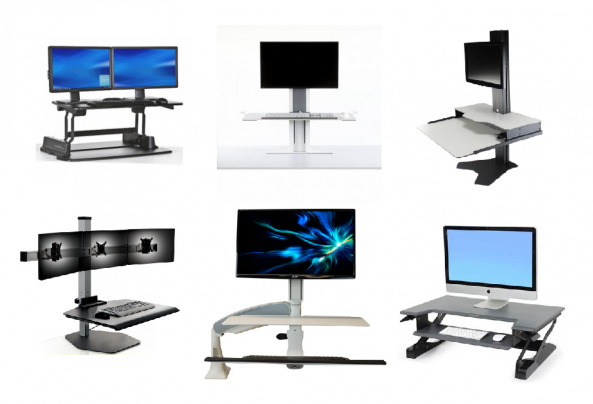 For more top-notch standing desk converters, check out our Standing Desk Converter Comparison Review. 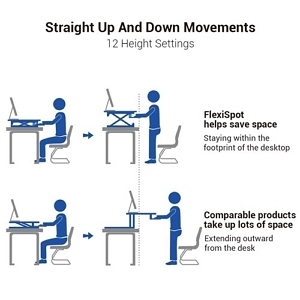 Like the Workfit-T, and unlike the Varidesk, the Flexispot standing desk converters move straight up and down. Quick and easy height changes are accomplished by reaching forward to the paddles on each side of the unit, squeezing down to release the brakes, changing height, and releasing the paddles. Despite the lift mechanism using gas cylinders, not springs, the Flexidesk design is similar to the older Varidesk and Workfit-T designs with its limited number of stops - only 12 - instead of having infinite stops like the ZipLift has. Loctek claims they've tested the Flexispot 6,000 times. The slot in the front of the top work surface is for holding a tablet computer. 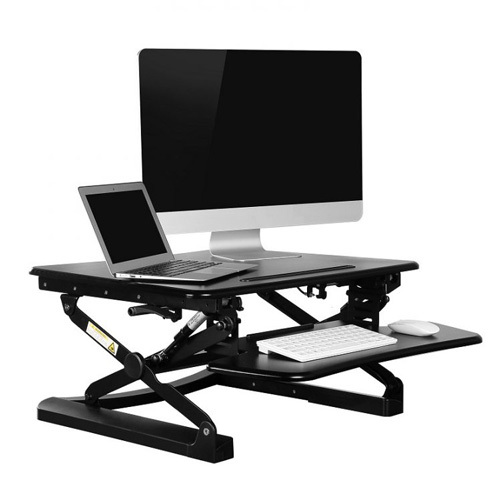 Like the ZipLift, the Flexispot would have no problem fitting comfortably on a 24"-deep desk.